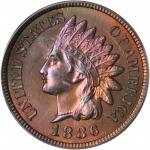 1877 Indian Cent. Snow-1. MS-65 RD (PCGS). 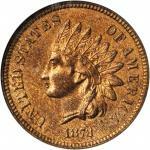 Offered is a remarkable condition rarity for this issue that is scarce and desirable even in lower Mint State grades. Both sides are boldly struck with sharp detail that wanes only minimally at some of the feather tips in Libertys headdress and along the left and right edges of the wreath on the reverse. The satiny surfaces are as smooth as would be expected for the assigned grade, with a full vivid pinkish-rose and medium orange color. 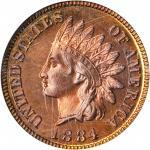 This 1877 cent is a delight to behold and will be just right for an advanced Indian cent collection.<p>Although the final year 1909-S has a lower mintage, the 1877 is the undisputed key issue in the circulation strike Indian cent series. The mintage is 852,500 pieces, most examples of which slipped quietly into circulation during an era when numismatic interest was almost exclusively focused on Proofs. 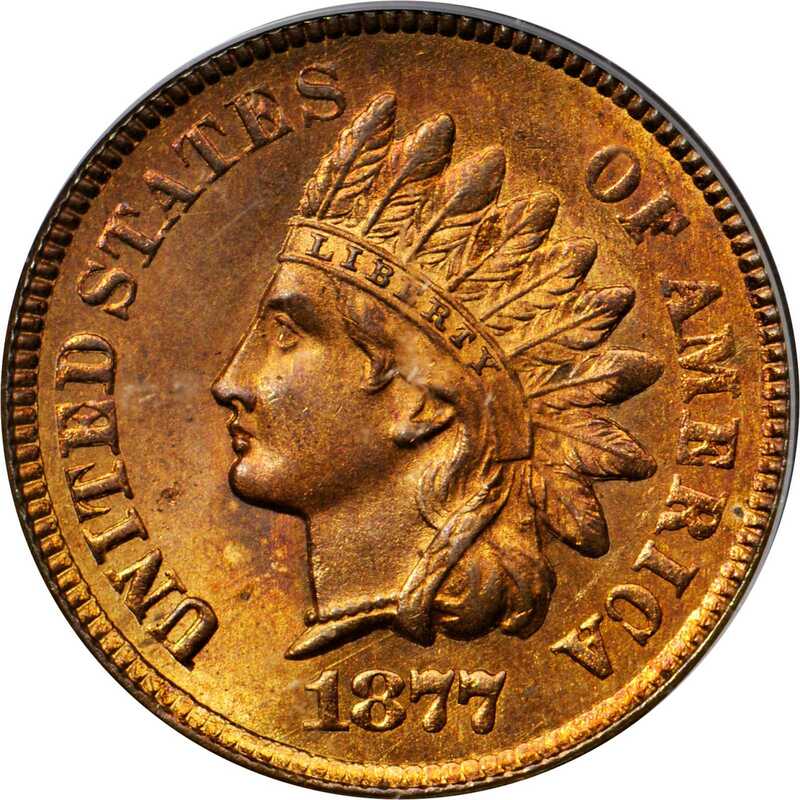 The reason for the limited mintage of cents in 1877 is interesting, and it is related in detail by Rick Snow in the 2014 edition of <em>The Flying Eagle & Indian Cent Attribution Guide</em>. 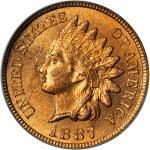 Briefly, the bronze small cent, although popular during the coinage-starved Civil War and early Reconstruction eras, became a burden to banks and merchants beginning in the 1870s. As banks, in particular, took in more cents than the general public required, large quantities of unwanted coins soon accumulated. Through the Act of 1871, Congress came to the rescue by authorizing the Mint to redeem earlier bronze (as well as copper and nickel) coins, melt them, and use the metal to strike new pieces. 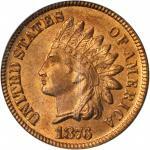 Many bronze Indian cents dated 1864 to 1870 were returned to the Mint and destroyed, explaining the scarcity of these issues in todays market.<p>Beginning in 1874, however, the Mint changed its handling of these redeemed coins. Rather than melting them and using the metal to strike new coins, the Mint greatly simplified the process by cleaning and reissuing the redeemed coins. Additional commercial demand was met by the striking of new examples that the Mint would issue alongside the redeemed pieces. In 1877, the Mint redeemed 9,908,148 earlier dated bronze cents, 9,821,500 examples of which were reissued. This distribution met most of the commercial demand, explaining the mintage of 852,500 circulation strikes that year.<p>Long recognized as the rarest circulation strike Indian cent, the 1877 is particularly desirable in Mint State, at which level it is scarce in an absolute sense. With most Uncirculated survivors grading no finer than MS-64 RB, Gem full Red examples such as that offered here are undeniably rare from a condition standpoint. One of the most important circulation strike 1877 cents that we have offered in recent sales, this coin is sure to see spirited bidding.PCGS Population: 23; 11 finer in this category (MS-66 RD finest).From the Beasley Collection. Earlier ex Newcomb Collection.